A man dived in a river in freezing temperatures in a futile attempt to escape police following an eight-vehicle collision which has caused traffic chaos on the A27. Three men ran from a Mercedes after it crashed near the Southerham roundabout near Lewes at 4.12pm, following a police chase. One managed to swim across the river in attempt to evade capture, but was picked up by police as he emerged on the opposite bank. He was taken to hospital under arrest, along with another of the car's occupants who suffered an arm injury in the collision. The driver of another vehicle involved in the collision had a suspected broken collarbone and was also taken to the Royal Sussex County Hospital in Brighton. The pursuit began at the A23 just north of Pyecombe, where police noticed the vehicle was speeding. It then turned on to the A27, police said. It rammed a police car at the A23/A27 interchange before continuing on towards the eastern end of Lewes by-pass where it collided with a number of other vehicles, according to police. A police spokesman said: "Motorists are being advised to avoid the area. 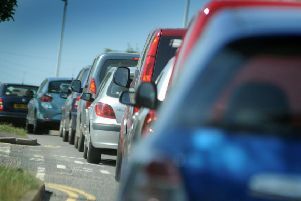 Westbound traffic is moving slowly, but the road is closed eastbound at the Kingston roundabout resulting in serious congestion in the area and in Lewes itself. The road closure is likely to continue into the evening and drivers are recommended to seek alternative routes as soon as they are able." Sergeant Stacey Elliott from the Surrey and Sussex roads policing unit said: "We are aware that this is causing considerable disruption and we are working as swiftly as possible to reopen the road, but this will take some time and we thank people for their patience. I am hoping that we will have the road open again by around 9pm." Anyone who witnessed the collision or any of the incidents leading up to it is asked to report online or call 101 quoting Operation Raydon.